After taking part in the New York City Wine & Food Festival in October, Timbers Resorts has been invited to take part in its winter equivalent, affectionately known as SOBE Wine & Food (or in Twitterspeak, #SOBEWFF). And with many of our Owners and friends residing in Miami all or part of the year, there's nowhere else Timbers Resorts would rather be. If you join in the festivities, you'll find Timbers Resorts at Wine Spectator’s Best of the Best at the Fontainebleau Miami on Friday, February 22, and at the Tribute Dinner at Loews Miami Beach Hotel on Saturday, February 23. 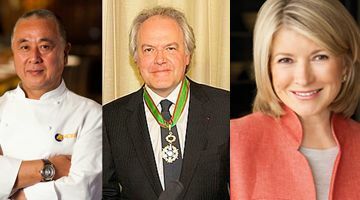 At SOBE Wine & Food Festival’s must-attend event — a tribute dinner for Nobu Matsuhisa hosted by Martha Stewart — Timbers Resorts will be a contributor to the live auction, so don't forget your checkbook. Of course, simply attending the main event — SOBE Wine & Food Festival's Grand Tasting Village — is a fun and exciting excursion in itself. Catch demonstrations from rock star chefs including Bobby Flay, Paula Deen, Rocco DiSpirito, Rachael Ray and others, or simply taste the wares from hundreds of wineries, restaurants and even liquor companies and tourism boards. To learn more about Timbers Resorts' lifestyle of fine food, wine and travel, please contact us via email at info@timbersresorts.com or by phone, 888.366.6641.